There’s nothing quite like painting in oil. For me, it’s a childhood dream come true. But along with all the advantages comes the disadvantage of the fumes or volatile organic compounds (VOCs). VOCs can’t be seen, but that doesn’t mean that they can’t be hazardous to your health. While there are many compounds out there that are more problematic than the mediums and solvents we use with artist’s oils, it pays to educate yourself about the possible affects. The EPA has a page devoted to the topic. I know a couple of local artists who have had serious problems with their reaction to VOCs. One had to quit painting in oil for awhile and switch to watercolor. He has been able to go back to oils, but also now has a studio with really good ventilation. The other artist has had to switch to watercolor permanently. With them as an example, I decided that I had better get serious about the air quality in my studio because I didn’t want the same thing to happen to me. Here are four ways to improve the air in your studio. They range from pretty cheap to pretty expensive, so you might have to choose the combination that works best for you in terms of space and finances. But do educate yourself on the issue and take whatever steps you can. 1. 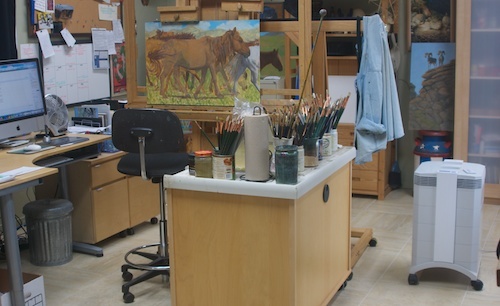 I have a small table fan to my left that keeps the air between me and the easel moving. I think we can underestimate or not even think about the miasma of fumes we sit in as they come off the paint once it has medium or solvent in it, our brushes and the painting surface. 2. I have a small steel trash can with a snug-fitting lid under my desk, which is next to my easel. All rags go into that as soon as I’m done with them. Then they go to HazMat disposal. This also reduces the fire danger that comes from flammable rags laying around. I worked for a sign painter back in the late 1970s who had been in two different shops which burned down because of the spontaneous combustion of paint and solvent soaked rags, so I learned proper storage and disposal a long time ago. None of the volatile stuff that we use as oil painters should EVER go to a landfill. And I would never lay rags out flat and let them release their fumes into the air of my studio while they dry. If you want to do that, take them outside. 3. I have a air cleaner with a VOC carbon filter running at all times when I’m working. One that really does the job is not cheap, but I bought an IQ Air HealthPro Plus and have never regretted it. It’s a roll-around floor model that I keep on the right hand side and can push back into the corner if I want it out of the way. 4. Use non-volatile mediums and solvents as much as possible. One of life’s little ironies is that a lot of the best-performing, most-love oil painting materials are also the most toxic and/or volatile. If there’s something like Liquin or damar varnish that you just can’t live without, then find healthier alternatives for your other requirements. Google “non-toxic artist oils” for more information. Be aware that odorless mineral spirits, which is what I currently use as a solvent, does not mean that there are no VOCs. It simply means you can’t smell them. So I keep the lid on the jar except when I’m painting. I just bought some walnut oil and will be experimenting to see if I can use it instead of Liquin. I switched many years ago to citrus-based Turpenoid Natural for cleaning my brushes. Hope you find this helpful. Happy painting! Mongolia Monday- Almost Time For My Next Trip! I have allergies, which makes acrylic painting better for my health. Recently, I got into encaustic painting. The window and fans are on the entire time, until the wax is back cooled solid. Great post on safety. Most people don’t think about safety and art studios.